The first slave ships arrived on the shores of North America in approximately 1619, bringing kidnapped Africans who were sold to farmers in the colony of Virginia. For more than 150 years, European settlers in southeastern territories adopted the practice of buying slaves to work on their cotton and tobacco plantations, forcing them to perform hard labor in order to produce profitable crops. By 1860, there were an estimated 4 million slaves of African descent living in the United States. Turmoil arose within the country over the issue of slavery in the 1770’s, as many Northerners, known as abolitionists, morally opposed it. The Constitution of the United States, written in 1787, actually contained provisions regarding slavery, which Southerners used to justify their position. It is not true that our fathers, as Judge Douglas assumes, made this government part slave and part free. Understand the sense in which he puts it. He assumes that slavery is a rightful thing within itself – was introduced by the framers of the Constitution. The exact truth is that they found the institution existing among us, and they left it as they found it…they left it among them because of the difficulty – the absolute impossibility of its immediate removal. Abraham Lincoln stepped into the presidential arena at perhaps the most volatile time in American history – the Northern and Southern states were on the verge of dividing themselves into two countries, a separation that would have surely jeopardized the future of such a young country. Lincoln used his excellent oratory skills to unite the Northern states, which became known as the Union, but when Lincoln won the election, the Southern states voted for secession and created the Confederacy. How did a man with scarcely one year of formal education become President of the United States? Through determination and perseverance, Abraham Lincoln educated himself. It is even said that Lincoln used to carry a book with him everywhere he went, whether at home, in the barn, or in the fields. Lincoln simply loved to read, and it was this kind of self-education that enabled him to become an attorney, spend eight years as a politician for the state of Illinois, and serve as a national Congressman before becoming the sixteenth president of the United States. Abraham Lincoln suffered from a genetic condition that caused him to be extremely thin and tall; he was 6’4”, at a time when a man’s height averaged 5’6”. He frequently made fun of his looks amongst friends as he knew he was a curiosity. Lincoln also suffered bouts of depression throughout his life due to losing his first fiancée, and then three of his four beloved sons over several years. However, Lincoln managed to conceal his personal anguish and carried on his leadership as though unaffected. During the presidential campaign debates in 1858, Lincoln revealed his true opinion about slavery and the alleged Constitutional right to return fugitive slaves to their owner: “...I do not believe it is a constitutional right to hold slaves in a Territory of the United States. I believe the decision was improperly made, and I go for reversing it...” He continued: “In order to beat our opponents, I think we want and must have a national policy in regard to the institution of slavery, that acknowledges and deals with that institution as being wrong....We believe- nay, we know, that that is the only thing that has ever threatened the perpetuity of the Union itself...” Lincoln was indeed opposed to slavery, but he also had to address the enormous challenge of rejoining a country that was splitting at the seams. After Abraham Lincoln won the presidential election in 1860, he addressed southern states in his Inaugural Address: “In your hands, my dissatisfied fellow countrymen, and not in mine, is the momentous issue of civil war. The government will not assail you…You have no oath registered in Heaven to destroy the government, while I shall have the most solemn one to preserve, protect and defend it.” Lincoln believed that all the states in America should remain united as one nation, and furthermore, he had to bear the heavy responsibility of his new role as President. He did not want to see his beloved country torn apart by war, and believed that violence was not the solution to the deep disagreements that were spreading throughout the United States. However, a civil war did erupt in 1861 and it proved to be the bloodiest war in the history of the United States to date, with an estimated loss of three percent of the population. The war also decimated the grandeur and wealth of the South, and greatly reduced the formerly prominent influence of Southerners in the federal government. Emancipation caused a new problem for the country…what do you do with four million newly freed slaves? Many ideas were discussed amongst politicians in Washington D.C. such as the voluntary re-colonization of African-Americans on their own land. This meant that blacks would be sent to Central America and the Caribbean, where they could live freely. This idea satisfied those who worried that freed slaves would enter the work force and take jobs away from white Americans. Frederick Douglass, a prominent African-American speaker and advisor to abolitionists and politicians during the nineteenth century, was insulted and angry at the proposition. He argued that it not only further undermined the position of blacks in the United States, but also foolishly implied that the nation’s problems would disappear along with its African-American citizens. Douglass discussed these issues with Lincoln, who ultimately decided to seek a more noble and just solution. In April of 1864, reflecting on his early attempts to peacefully mediate between the North and South, the horrors of the war, and the eventual emancipation of slaves, Lincoln humbly wrote, "I claim not to have controlled events, but confess plainly that events have controlled me. Now, at the end of three years struggle the nation's condition is not what either party, or any man devised, or expected. God alone can claim it." Abraham Lincoln’s life ended violently and prematurely due to his belief that slavery was wrong. He was assassinated by an angry Confederate supporter at Ford’s Theatre in Washington D.C. on April 14, 1865. 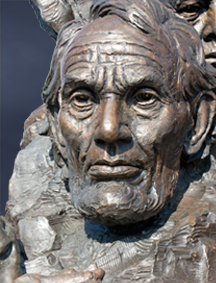 His death propelled him to the status of a national martyr, and despite his self-proclaimed human flaws, Lincoln will be remembered as a true champion for human rights. It has pleased Almighty God to prolong our national life another year, defending us with His guardian care against unfriendly designs from abroad and vouchsafing to us in His mercy many and signal victories over the enemy, who is of our own household. It has also pleased our Heavenly Father to favor as well our citizens in their homes as our soldiers in their camps and our sailors on the rivers and seas with unusual health. He has largely augmented our free population by emancipation and by immigration, while He has opened to us new sources of wealth and has crowned the labor of our workingmen in every department of industry with abundant rewards. Moreover, He has been pleased to animate and inspire our minds and hearts with fortitude, courage, and resolution sufficient for the great trial of civil war into which we have been brought by our adherence as a nation to the cause of freedom and humanity, and to afford to us reasonable hopes of an ultimate and happy deliverance from all our dangers and afflictions. Done at the City of Washington, this twentieth day of October, in the year of Lord one thousand eight hundred and sixty-four, and of the independence of the United States the eighty-ninth. Roy P. Basler, ed., The Collected Works of Abraham Lincoln (New Jersey: Rutgers University Press, 1953-1955) Vol. 3, 21. Abraham Lincoln, Abraham Lincoln: Selected Writings (Springfield: Templegate Publishers, 1997) 115-116. Tanya Lee Stone, Abraham Lincoln: A photographic story of a life (New York: DK Publishing, 2005) 17. The Words of Abraham Lincoln: Speeches, Letters, Proclamations, and Papers of our Most Eloquent President, ed. Martin Lubin (New York: Black Dog & Leventhal Publishers, Inc., 2005) 205. James C. Humes, The Wit and Wisdom of Abraham Lincoln: A Treasury of More Than 1,000 Quotations and Anecdotes (New York: HarperCollins, 1996) 40. “Abraham Lincoln”. http://www.whitehouse.gov/about/presidents/AbrahamLincoln/. 31 August 2011. Al Nofi, “Statistics on the War’s Costs”, Louisiana State University, 13 June 2001, http://web.archive.org/web/20070711050249/http://www.cwc.lsu.edu/other/stats/warcost.htm, accessed 1 Dec. 2011. “The Civil War: Finally Passing”, The Economist, 2 April 2011, 23-25. “Abraham Lincoln”. http://www.whitehouse.gov/about/presidents/AbrahamLincoln. 31 August 2011. David Herbert Donald, Lincoln (New York: Touchstone, 1995) 514. © 2013 Oakland Chamber of Commerce. All Rights Reserved.